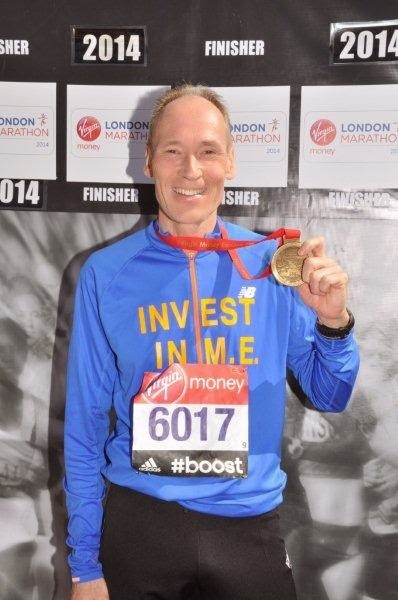 Well the dust has settled so it’s time to reflect on my attempt to run the London Marathon for Invest in M.E. I have been trying for a number of years to enter this event but I wouldn’t sign up to the bigger charities and that reduced my chances of being selected and so I had been unsuccessful in gaining an entry place for many years. That was until October 2013 when my acceptance letter dropped through the letter box at Chez-Cox. After breaking the news to the current Mrs Cox (she’ll love that!) 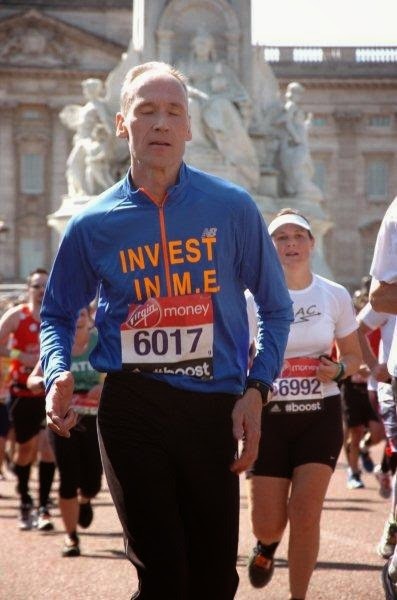 , she agreed that I would run in support of Invest in M.E. I say ‘agreed’ but really it was never going to be any other charity and ‘agree’ also implies that I had any say in it. The aim was to raise £1000 and a page was set up on the ‘Just-Giving’ website to do just that. Considering myself relatively fit (as in healthy) for someone the wrong side of 54, I was sure it would be no problem. I am used to endurance events having cycled John O’Groats to Lands End, Calais to the Med and the length of the Pyrenees and still play football regularly. So with this in mind I started with a plan to go running twice a week from Christmas and build up by adding one extra mile each week, that way I reckoned I would get up to over 20 by April. My first run was 5 miles, and over the next month or so I managed to increase it to running 10 miles at each training session. However I wasn’t able to go out as often as I would have liked so I wasn’t sure if my plan was going to be enough. At this point I decided I needed to increase by 2 miles each week. This was during what was one of the wettest Jan/Feb in memory and it was a while until I actually ran when it wasn’t raining. The other thing I found hard was the boredom. Running to me was really boring, even with a radio/headphones. My route by now was a loop that took me along the River Taff in Cardiff and down to the Barrage in Cardiff Bay and then back on the other side of the river. At least this way I didn’t run too much on the same, boring, bit of road. A key milestone was getting over 13 miles (a half marathon) and then over 18 miles (over 2/3rds of a marathon). In the end the most I did was 22 miles and by the end of March this was twice a week. At that point, the best advice I read was that you should ease off in the last few weeks. So that was what I did. My thinking was well I know I can do 22 so even if I have to walk the last bit, I will finish. Throughout this time there had been a steady flow of people making donations to the just-giving webpage. Having booked my hotel, final details came through for the registration process, so all was set for the big day. The forecast at the start of the final week indicated that it was going to be a dry day so that was another thing in my favour. So on Saturday 12th April I drove up to London and took the tube to the registration exhibition. Having picked up my number I realised that this was it, there wasn’t an option to back out. For a start the donations had gone well past the £1000 target but also no-one would go against Rosie now would they! I returned to the hotel and had an early meal. I awoke at 6.00 to get up and have breakfast. This didn’t quite go to plan as the chef had not turned up. I contemplated making my own breakfast when thankfully another kitchen employee arrived and soon I was able to tuck into my porridge. After getting my kit ready I walked the short distance to the tube and in what seemed like no time but was in fact an hour I was walking out of Blackheath Station towards the start area. It was about 9:15 but already it was really warm. There wasn’t a cloud in the sky and very little breeze. I dropped off my belongings to the lorry that would hopefully take them to the finish area and walked towards the start. It turned out that I would not be starting next to Mia Farrow et al (sorry Mo Farah) rather I was at the back of the blue start area. Most of the people around me were kitted out in running vest and shorts and I became aware that I was going to feel a little warm. There were loads of charities represented, the usual biggies, but not one for M.E. that I saw. That did actually give me a bit of a lift as I like a challenge (I am married to Rosie after all!) so it was me against the rest of them, all 38,000! I set my GPS watch ready for 10.00 and the countdown started 10,9……3,2,1 and that was it we were off. Except we weren’t. We were actually going nowhere, such are the sheer numbers doing this. Eventually we started to walk then jog a little and finally after nearly 10 minutes we crossed the start line. 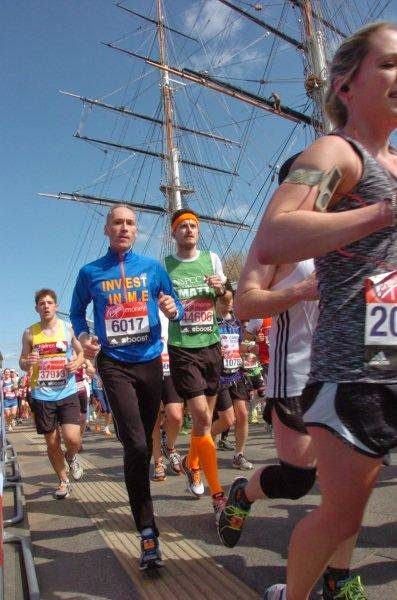 The crowd in the grandstand gave everyone a huge cheer and so I set off with one thought in my mind – I must finish. Actually I had a few thoughts, I want to get under 4 hours, I don’t want to walk and I don’t want to stop, I wonder if anyone is watching out for me on TV or the route. The first few miles went slowly and I soon realised that I had little choice but to run at the pace of the pack. If I wanted to go faster I would have to do some weaving in and out of the other runners. Some people were doing this and it annoyed me a lot so I thought it better not to do it. Anyway I reckoned that this strategy probably meant I would do a more steady run. After about 3-4 miles there was a converging of the other start groups so that we were all now running on the same road. I tried to imagine what this would look like from the sky as it snaked its way through Woolwich. The noise from the crowd was amazing and most of the pubs along the way had a live band or music pumping out. A lot of the crowd were singing the theme from Batman. Now in my younger days I quite enjoyed watching Bruce Wayne beat the crap out of the Riddler etc but this was a bit annoying. Then I saw running alongside me a guy dressed as Batman and another as Robin. The thought of listening to that tune for another 20 miles gave me a little impetus to move up a few places. So I found myself behind Wally (or Waldo as I think he is called in the States) so for the next few miles a lot of the shouts were “look at that Wally!”. At the 6 miles point we reached the Cutty Sark and the noise was quite deafening. The crowd was huge. A wheelchair athlete was right in the middle of the pack and I looked at the way he was turning the wheels, amazing strength. 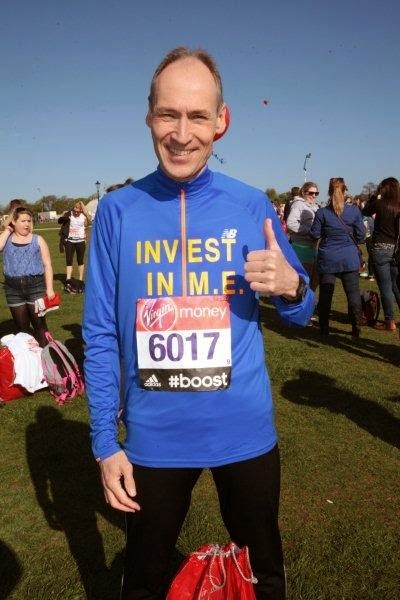 Practically no-one was running without their charity name but no one had lettering as big as mine and plenty of people shouted out “Go Invest in M.E”. Some people I passed were already walking, I think the heat was getting to them. I was regretting not wearing shorts and if I hadn’t been nearing half way I would gone back for them (not). The route winded towards Tower Bridge and across towards the half-way point. A Beefeater was perched on top of the wall at the Tower of London and I all I could think of was Rosie saying “oh my gosh how can he stand at the edge like that, you wouldn’t catch me up there”. It also made me think about people being locked in the Tower but I don’t think the two thoughts were connected (necessarilyJ). We were running along the right hand side of the road and on the other side there were the elite athletes nearing the final 4 miles. The looked ‘done in’ to be honest but they were about an hour ahead, amazing. We started to wind our way out into the financial sector around Canary Wharf. Probably enough money made here in an hour to properly fund some research and find a cure for ME! Life isn’t fair. Some runners were at the side of the road, stretching their leg muscles or even lying down exhausted. I was quite pleased that I was still tootling along. However, I was nearing 17 miles now and started to feel a pain in my left hip. I started to imagine that this was going to make me stop. I knew that Rosie’s sister was hoping to stand at the side of the road at about 22 miles so I told myself to keep going until then and see how it was. The next few miles took us back along the stretch of road we had been on from Tower Bridge and so there were people coming the other way. Many were walking but the crowd was just as big and just as supportive. We passed Tower Bridge again and I moved over to the left had side of the road in the hope of seeing Liz. In a mile or two I saw her and she saw me too. She gave a huge cheer and I gave the thumbs up. 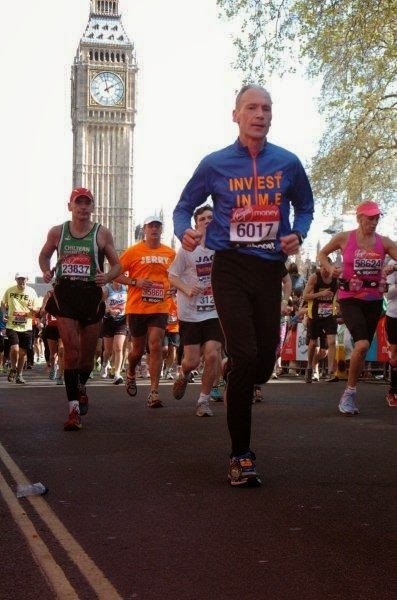 As I passed her I realised that my hip was no longer there, no sorry!, it was there but no longer hurting J.
I was now running further than I had run before but I could see Big Ben up ahead. I hoped it was the real Big Ben and not someone dressed up as Big Ben! This part of the course follows a bend in the River Thames so it took a while to actually get close to Big Ben but just before I did I ran through the 40 kilometre point. From my cycling on the continent I knew 40k was equivalent to 25 miles. Wow, it sank in: I was going to finish and I was going to do it without stopping or walking. As I rounded the corner by the Houses of Parliament one of the people in front of me had been reduced to walking. Clearly his legs had gone completely to jelly and he looked really white. Fortunately two people took hold of him and they started walking together. Good for you I thought, cos I wasn’t going to stop now. 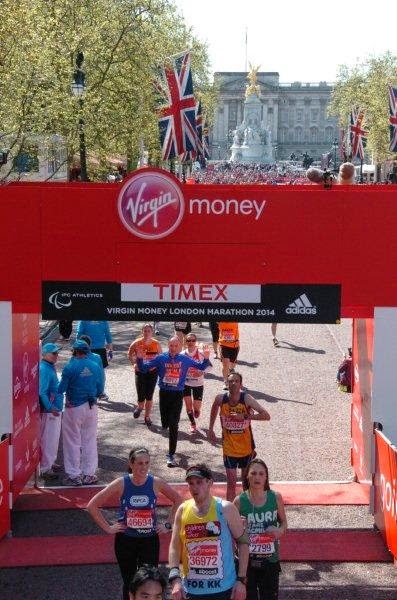 The next sign said 600 metres to the finish and I realised that I had no idea what time I was doing. I headed towards the palace and turned onto the Mall. I could see the finish and started sprinting. No one else was and people in the grandstand were shouting and cheering as I overtook a number of runners. At this point I could hear the loudspeakers and they were saying Liverpool were beating Manchester City, what a day: I was finishing the London Marathon and Liverpool were still top of the Premier league, brilliant! I crossed the line and stopped my watch, the time showed 3:57. I’d done it! I’d finished and inside 4hrs. Then you are into the finish area and they remove the timing chip and you are given your medal. It was heavier than I expected and nicely engraved. A goodie bag is handed to you. This was intriguing in that it contained an apple, a drink and an energy bar. But also a spray can of deodorant! After a photo with my medal, I phoned home and Rosie told me all about the on-line tracking and twitter and face-book activity and also the way the funding had gone. I was really taken aback by all the interest and support and shed a tear or two sitting eating my energy bar. Not because of what I had done but because I wished it wasn’t needed. I walked out under Admiralty Arch towards Trafalgar Square and the Tube. There were a lot of runners around, some flat out on the floor, others barely walking but all proudly wearing their medal. It took an hour or so to get back to the hotel and I was aware of the amount of sweat and salt on my running top and face. 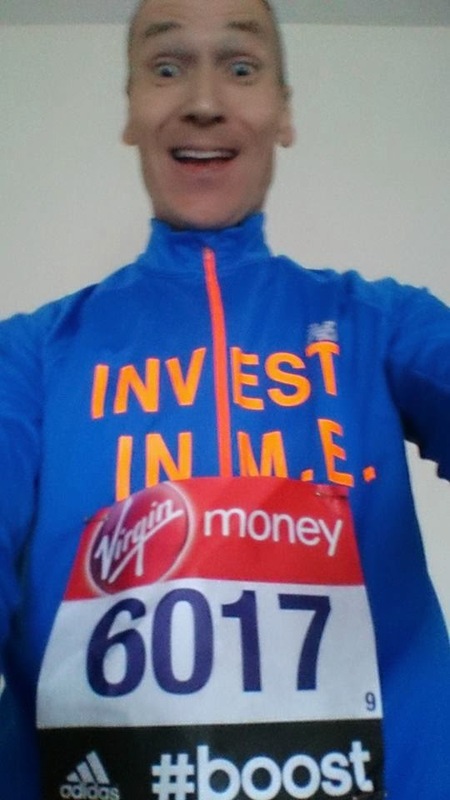 I kept it on though - more publicity for Invest in M.E. The drive home took a couple of hours and I was welcomed by Rosie, Lucy and Thomas and a glass of Champagne. An incredible 24 hours had concluded the last few months’ of effort. Donations were still coming in and it seemed we were going to get past £2k. Once again Rosie was right…… (isn’t she always ;) ? ). Thank you everyone for your support both financially and by way of encouragement. In the whole scheme of things it seems a small thing to have done when compared to the impact of this dreadful illness on people’s lives. However it’s another step towards getting proper research, better understanding and ultimately a cure. Let's Move the Goalposts for ME! 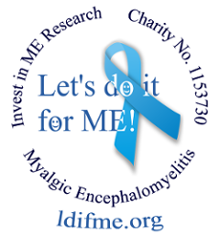 Invest in ME Wins Direct Debit BIG Break! Success of Our Campaign Makes News!